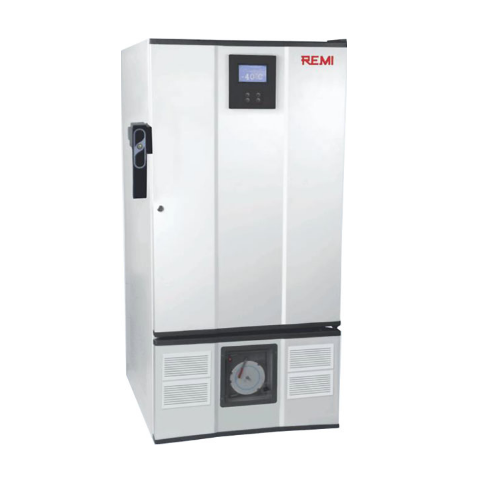 Safe, Reliable storage of Blood Plasma at -40°C, REMI Plasma Freezers are available in optimum sizes for small, medium and large blood centers. High performance refrigeration system yields fast temperature pull down and rapid temperature recovery to better protect stored plasma. Durable, corrosion resistant materials has been used for the refrigerators to provide years of reliable performance. Copper tubes used for refrigeration are bright Annealed high quality conforming to ASTM B grade 68. Each unit comes with stainless steel drawer construction with Perfect-Grip coordinated handles and fully extendable drawer slides. Refrigerator unit provides complete and safe plasma storage monitoring via microprocessor based integrated monitoring system in Ultra Models Vs Digital Controls in Base Models and 7 days circular chart recorder. Audio visual alarms ensure manual check on storage conditions. Storage efficiency and temperature management data can be maintained for up to 1000 records. Networking is possible with 30 refrigerated units to transfer data through LAN to a common PC for further analysis. Freezer units are available in Ultra and Base Models with capacity to store 224 to 336 Bags to suit specific requirements of the Blood Centers. Large size temperature Display for ease of reading from distance. Power resumption & failure recorded with date & time.